Deep sea fishing in Port Antonio is among the best fishing location in Jamaica. The city of Port Antonio is among the lease develop part of Jamaica and not spoiled my vast commercialization or tourism. Port Antonio is the Capital of Portland and located north east coast of Jamaica, in the parish of Portland. The two closest cities are Kingston (which is about 54 miles away) and Ocho Rios (which is about 60 miles away). What this mean to anglers all over are some of the best fishing on the island, because those waters are not over fish and have some of the biggest blue marlin ever caught in Jamaica. This is one of the main reason the annual marlin tournament (Port Antonio International Marlin Tournament), is held at the Errol Flynn Marina. The tournament attracted anglers from all over the world who come to Jamaica each year, trying to land a record blue marlin. The Port Antonio Marlin Tournament has become one of the largest annual events in the city of Port Antonio. So strap yourself into the chair & get ready for the fight of your life once you get a strike and the fish is on your line. Our lines and reels are of the highest standard, similar to those use in the major blue marlin tournaments. Our fishing charters are both catch & land or catch & release for sustainable fishing. If you choose to land your catch, we can arrange for a chef to cook you a sumptuous meal from your catch. 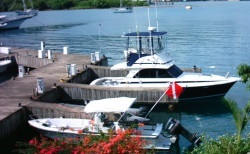 Our deep sea fishing charter operate boats operate out of the Port Antonio Marina 7 days a week. We also offer pickup to and from your hotel, villa or holiday accommodation. Deep sea fishing charter start around 7:00 am or 12:00 noon daily. This will give you plenty of time to catch several fish on a half or full day fishing trip. The boats have comfortable cabins, bedroom, bathroom, galley, air conditioned, refrigerator, stove, microwave, shower and are fully equipped for your adventure at sea. Each deep sea fishing boat comes with a professional crew with solid reputation for landing the big fish such as Blue/White Marlin, Kingfish, Wahoo, Yellowfin Tuna, Striped Tuna, Blackfin Tuna and Mahi Mahi. Light snacks and beverages are provided on the boat for your enjoyment, extra can be supplied a local rate upon request include Red Stripe Beer, water, soda pop, champagne :: Rice and peas, rolls, chicken, jerk pork, vegetables etc. Be sure to book your Deep Sea Fishing well in advance to ensure that you will get to go fishing on the date and time of your choosing. Half Day Deep Sea Fishing (1-4 people). Additional persons $50 US each. Full Day Deep Sea Fishing (1-4 people). Additional persons $75 US each. Note: Group discount is available for up-to 6 people on all charter. We offer pickup and drop off for our deep sea fishing parties from the following hotels. We also pickup from other holiday properties not listed here, just ask when you make your enquiry.